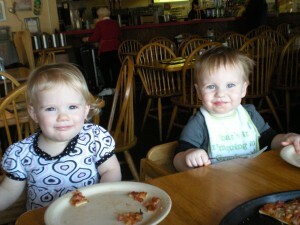 Ella had her first Valentine’s date with her friend, Drew! We went to Happy Joe’s pizzeria. It was delicious & fun! Ella & Drew enjoyed pushing all the flashing buttons on the video games. Happy Valentine’s Day! 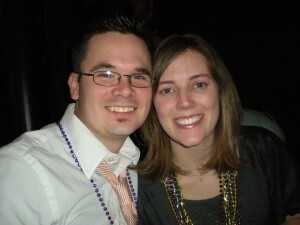 My little family had a nice, chill Valentine’s Day ending with a very tasty meal at Las Margaritas. I am kind of obsessed with their queso dip. It rocks my world. Begin Amazing Race 14! I love this show, and it made me realize that I needed to find the application so my brother and I could apply! We’ve been talking about applying for TAR for a long time, but now that he has graduated, we finally have coordinating schedules. It has already been decided that he will do the nasty eating challenges and I will do the jumping-off-high-stuff challenges. I FINALLY find the Amazing Race applications online. Through the CBS website (& website search) the applications are 2 years old. I had to google Amazing Race 15 application, and through a blog, found what I needed. WARNING: The Race applications are due on TUESDAY FEB. 24!!!! Like, they have to arrive by Tuesday. We had a few days to fill out the 11 page application, get our proof of passport, pictures, and make a 3 minute DVD of why we should be on the Race. Chris & I work on our DVD and get it finished at night. It’s not as Amazing as it could be, but we didn’t have much time! Oh, and I’m sure that the 10 seconds of Ella dancing on the end will push the vote in our favor. Right? Hooray! I’ve made it to 27. I am now in my late twenties, inching ever so slowly to 30. Plus, Kate made me some cookie dough truffles (YUM!) and I got to eat dinner at Rich & Charlie’s with Dave & Ella, my parents, Chris, and my uncle & aunt! Also yum. Ella loves her some mostaccioli! And, as a fantastic surprise, Annette & Sara made me a star-shaped princess cake! It is delicious. And pink! I have fabulous friends who definitely know how to make the transition from mid to late twenties smoother! Thanks girls! 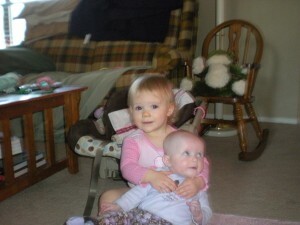 Oh, and Ella LOVES her friend Breanna. I mailed our Amazing Race application. I sent it guaranteed mail to ensure that it would arrive on Monday. I can’t afford to take any risks that it would be late! After Ella went to bed, some of my best friends & I went to Jive & Wail to celebrate my birthday! It was so much fun! Even though they messed up my table reservation (or maybe they just can’t count to 12?) we all had a great time! I had a few birthday drinks & we all sang very loudly. I got to play tambourine on stage during “Build Me Up Buttercup” (and YES I do have rhythm, you silly piano guy!). Annette & Sara danced on stage to the “Time Warp”. 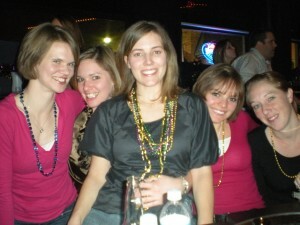 Since it was Mardi Gras, there were lots of crazy people around us, including a bachelorette party. 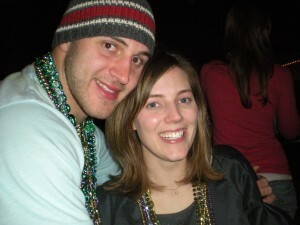 (Although I still maintain that when your wedding isn’t until April, February is too early for the bachelorette party.) Thank you to Dave, Dan, Kate, Melissa, Chris, Sara, Annette, Brad, Brent, Becky, Jaspy, Angela & Chris for celebrating with me! And a big thank you to my parents (and all the grandparents) who watched babies that night so we could go out! I hope I still have these awesome friends when I turn 28! I promise I have a couple of blogs drafted that are almost ready! i think: my pumpkin cookies are tasty. i know: we have a busy week ahead! i want: the weather to stay nice. i miss: my far away friends! i fear: working & working with no results. i feel: excited for my birthday! i smell: pumpkin cookies! yum. i cry: when I am sad. i usually: watch sportscenter in the morning. i don’t always: sit up straight. i argue: because I’m right! i write: not as often as I should. i win: Gauss hog battles. i lose: my mind sometimes. i wish: that chocolate was fat free. i listen: to Dave Matthews Band. i can usually be found: at home or at Target. i am afraid: that I won’t be a good parent. i need: a money tree! i forget: how to do Calculus. i am happy: to have my family & friends!